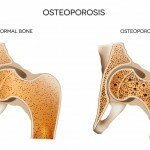 Osteoporosis is a bone disease whereby your bones loose tissue or you where they are not producing enough bone tissue. This results in weakened and brittle bones which are susceptible to breaking with little force. The can occur due to hormonal changes such as in menopause but in some cases in some cases can be sue to a deficiency in Calcium or Vitamin D. Usually there are no symptoms. However, when the bones become very weakened they may break. You may feel back pain due to a collapsed vertebra or fractures. Usually no pain is experienced until a fracture occurs. The most common osteoporotic sites are the back, hips and legs. Treatment is through medication prescribed by your GP. However, it is not uncommon for patients to attend physiotherapy clinics as the first line of treatment when suffering with pain. A detailed assessment is taken. During this the physiotherapist will be able to identify whether the pain is as a result of a possible fracture. Your physiotherapist will e able to either refer you for X-ray or directly back to your GP for further investigations. A Dexa scan is necessary for a proper diagnosis and in this case follow up treatment from your GP will be necessary. After the fracture has healed physiotherapy will be prescribed to help with improving bone mass and education on fitness and exercise.